Caption slip reads: "For early Wednesday or Sunday. Photographer: Snow. Date: 1952-04-21. Reporter: Cowles. Assignment: City Park garage showing south sections of three levels to be opened soon. 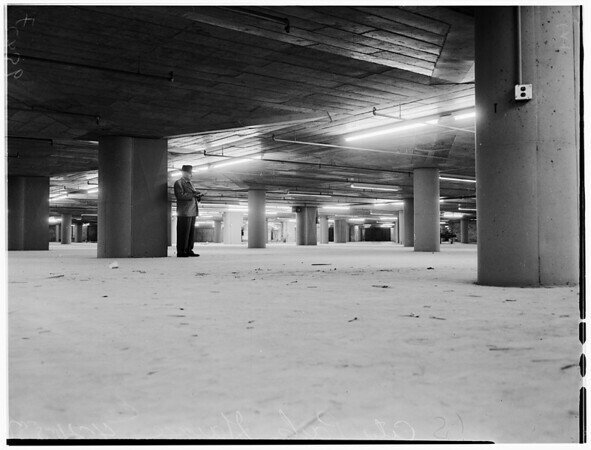 44: Bottom or 3rd floor level of underground City Park garage, looking southeast from south half of level to be opened soon. 1: Middle or 2nd floor, looking northwest. 2: Top or first floor looking sothwest toward 6th Street ramp".